Our archival collection has been located at the School of Nursing University of BC since 1998 and continues to grow. 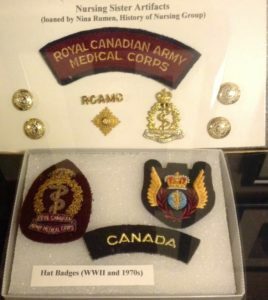 It consists of documents, photographs, personal papers, books, biographical files and oral history interviews pertaining to nurses who worked in BC or who were educated in BC and also contains records of BC nursing organizations. As well, there is a collection of artefacts such as uniforms, pins and equipment used in patient care. The archives is open by appointment only as it is staffed by a part time archivist and volunteers. It will be of special interest to nurses, family members, students, and researchers. The BCHNS Archives office is in the School of Nursing at the University of British Columbia. Telephone and e-mail requests are checked frequently.